After another chilly night (Matt’s wrist watch indicated 35° F inside the tent in the morning!) we awoke to another beautifully sunny day. Mt. Meru was in full view with cotton ball-like clouds spread like a blanket below and all around the peak. The first half of our day was spent gradually ascending toward Kili. Sadly we lost our cook today. Mosa was forced to descend from the mountain to deal with a painful toothache that was getting worse with the increase in altitude. A second porter departed with him, and so our support crew now has shrunk to 12. Their hard work never ceases to amaze us. It’s a wonder we still have any who are willing to continue on with us. As we approached Lava Tower at 4630 m, the high point of today’s trek, the Lemosho Trail joined up with three other routes (Ungwe, Machame and Shira), and the number of trekkers, guides and porters on the trail increased dramatically. From here on we would often hear someone shout “porter” from behind as a clue to step aside and let the hardworking support crews shuffle past with their heavy loads balanced on their shoulders and heads. After lunch in the shelter of Lava Rock, we descended out of the desert ecozone and back into heather moorland. 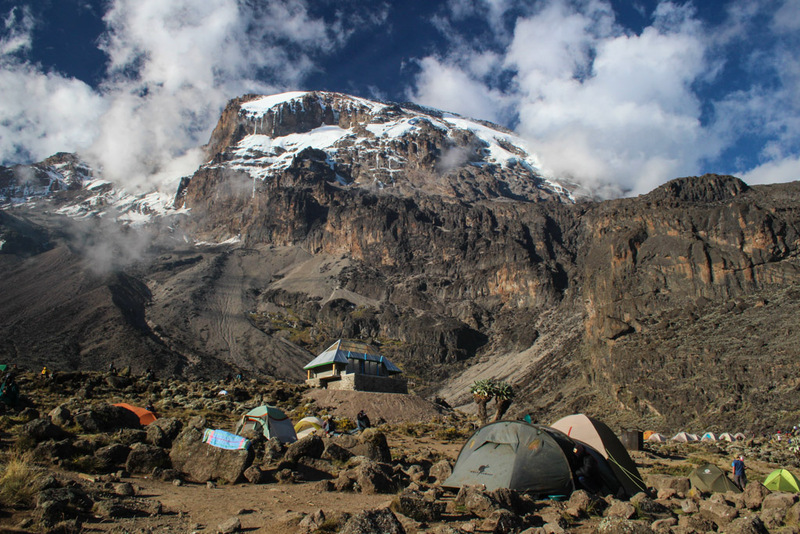 The trail wound itself closer to the mountain and below Uhuru Peak, which loomed ominously above us, capped in puffy white clouds and draped in hanging glaciers. The trail followed a canyon cut by a small stream lined with lobelia and giant senecio plants, giving it a look reminiscent of Joshua Tree National Park and the Mojave Desert in the American Southwest. As the Baranco Wall came into view we could see the camp below. Barranco Camp sits at 3900 m directly below Uhuru Peak, and we enjoyed the stunning views of both in the late afternoon light. This camp sits at the intersection of many trails, and there is a palpable sense of excitement amongst all of the hikers. Tomorrow we tackle our camp’s namesake, the Barranco Wall, where the real climbing begins. After a hearty dinner, we are off to bed. Lala salama! A note from Alison: Okay, I know what you are thinking. At least, I know what I was thinking when I watched my segment in today’s video: Geez Louise, she looks old! As always, Matt was a supportive husband and tried to convince me that I usually don’t look so terrible. There were simply lots of factors, he argued, that contributed to my haggard appearance: numerous days of hiking at extreme altitudes, bitterly cold temperatures, unbearably dusty conditions, lack of quality sleep, and not showering for four days straight…they’re all bound to take their toll. Part of me really wanted to throw that clip to the cutting room floor, but putting it in is just the kind of sacrifice I am willing to make for you, dear readers. Besides, as the old saying goes: the camera adds ten pounds years, right? Which clearly begs the next question: exactly how many cameras were on me? Great photos! What kind of camera kit do you carry? I’m struggling to figure out the ideal setup for my own adventure photography. Thank you! Ideally we both would be shooting with our Canon 7D body, but we decided that they were too heavy to carry up to over 19,000 feet, especially since we would be focusing more on the hiking than the photography. So for this trek, Matt carried a Canon Rebel, which is far lighter and more compact, and we had to share–tough for us to do. For the amount of time we focused on photography, it was the right choice. Weight is always a factor in adventure photography, isn’t it? Definitely! I carried a Nikon D5000 on my recent cycling tour in Iceland and it was almost too much. Also I nearly destroyed it from the road vibrations. I’ve been considering a mirrorless or maybe a Sony RX100, but it’s so hard sacrificing the quality and usability of a DSLR. It’s good to know other people are out there lugging them around too! I bet. We were worried about our cameras bouncing around on the Icelandic roads in a car–I can’t imagine a bicycle! The mirror-less option sounds like a good one. If you go that route, be sure to let us know what you think on your blog. We are definitely still trying to figure it out, too. The video was awesome. I’m going to have to try that popcorn and tea combination. Looks great! Thanks, Andy. Believe me when I say that the popcorn never tasted so good. Having said that, I bet anything would taste good by the time we pulled into camp each afternoon. Hiking builds up quite the appetite! It’s been fun reading your posts and seeing such similar experiences to ours. Absolutely love your photos! We were concerned bringing the larger digital camera on the mountain in case it got damaged so resorted to the iPhone. You’re also not the only one who thought they put on 10 years! Thank goodness there were no mirrors out there, right? We debated a long time about what camera equipment to bring. We were happy with the Rebel, but we would love to find a great point and shoot that we could have at the ready when we are hiking. Matt was carrying his iPhone, too, but he didn’t use it much for fear of draining the battery. Did you have a solar charger with you? I did have the Goal Zero solar charger and it worked great. But I also have a Rebel and I think I’ll be taking it on other treks in the future. We’re planning on the Annapurna Circuit next year and I’d like some great shots on that journey. Wonderful! We did the Annapurna Circuit two summers ago, and it was amazing. Definitely try to carry the Rebel with you–it will be worth it for the spectacular scenery and the fascinating cultures. Feel free to email us if you have any questions about the trip. I’d love to do it all again! Thank you for your GREAT blog about climbing Kili. It sounds intense and fulfilling. I was in West Africa for a month this past spring so understand a little of the cultural cross fertilization you experienced. I’d love to keep receiving your posts so will you please update my email? I’m closing “jacquie@sonic.net” and will be exclusively using jqrobb@gmail.com. Hi Jacquie! It’s so nice to hear from you. Thank you for reading our posts. We have never been to West Africa, but it is definitely on our list of places to go. Where were you and what were you doing? I will send a new blog invite right away to your new email. Thanks for letting us know about the change. Take care!